Grimoire: Manastorm – Multiplayer PC Wizard Shooter – A free to play multiplayer wizard FPS shooter available on Steam. Choose from six powerful wizards and customize your spellbook with dozens of abilities in this fast paced shooter. Grimoire: Manastorm is a free, multiplayer FPS in which powerful wizards battle for territory and prestige. Choose from six classes of magic, customize your spellbook with dozens of abilities, and prove yourself worthy of the Grimoire’s power in battles as cunning as they are fierce. Six wizard classes each with four unique spell slots and one unique passive ability. 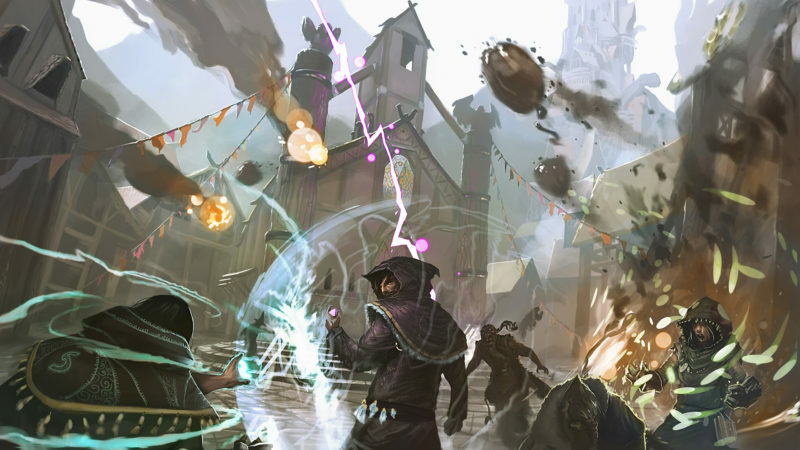 Customize each class by choosing from twelve different spells. Twelve fantasy-inspired maps including medieval cities, dark caverns, and towering cliffs. Freeze your enemies, teleport over buildings, or lay a deadly traps with 72 powerful and unique spells at your command! Further customize each class with eight inventive mobility and utility spells that range from teleportation to summoning unbreakable walls. Survival – a simple but challenging single-player wave survival game mode. Conquest – Magnus and Validus battle over control of key sources of magical energy known as ley-lines. The longer the ley-lines are held the more energy is gained including a large influx of power if one house can manage to take total control of an area. Destructible objects can reveal new territory or bring the environment crashing down on your enemies. Inspired by games like Day of Defeat, the Battlefield series, and Team Fortress 2; Conquest is a territorial battle that features large (8v8) teams. Free-For-All (Deathmatch) – Chaos reigns supreme in this fight to the death. This classic game mode is a great way to try out the game without worrying about objectives. Survival – The people of Orinfell are under attack! Hold off waves of undead fighters, mages, and golems as the survivors escape through the city’s catacombs. This game mode is great for testing out new spells and learning the basics of the game. The northern land of Futhark is home to two great houses locked in a bitter struggle. As ruin rises from the south, each vies for the Grimoire, a powerful artifact of a lost age. It was the Grimoire that ushered in the Dawn of Magic, called forth the destruction of an empire, and which now heralds civil war. Honorable House Magnus clings to their charge of sealing the book’s secrets, willing to sacrifice Futhark if only to save the world from the horrors held in the Grimoire’s binding. Ambitious House Validus has little time for craven hearts and strives to brave the tome’s power to save the republic and lead it into a golden age whose like has never been before seen. Yet the Grimoire is no idle prize to be fought for. That dusty tome has begun to glow, welcoming their dissent even as it spreads its pages, unleashing the Mana Storm in the battle to come.